This outstanding rhinestone jewelry set set has all Clear rhinestones on an 18 inch adjustable silver-plated chain, with lots of clear crystals surrounding a larger tear-drop shaped center stone. Matching earrings measure 1-3/4 inches and follow the same design. 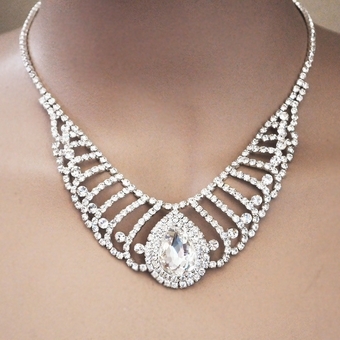 This is a stunning set you will enjoy wearing for your wedding, prom, or any special occasion.